The year 2017 will mark the 500th anniversary of the so-called Protestant "Reformation." It began with the nailing of the heretical "95 Theses" on the door of All Saints Church in Wittenberg by the heretic priest Martin Luther. He was condemned by Pope Leo X in the decrees Exurge Domine (June 15, 1520) and Decet Romanum Pontificem (January 3, 1521, which excommunicated him vitandus, i.e. "to be avoided"). On June 26, 2016, "Pope" Francis said on an interview, "I think that the intentions of Martin Luther were not mistaken. He was a reformer. Perhaps some methods were not correct. But in that time…the Church was not exactly a model to imitate. There was corruption in the Church, there was worldliness, attachment to money, to power...and this he protested." (Emphasis mine). The Church is always a model to imitate, the Holy Bride of Christ. The clergy are not always to be imitated; that's a huge difference. Those who read my posts regularly, know that I do not consider the Vatican II sect to be a false man-made religion based on the unnatural vice that plagues a large number of its clerics, but on the heretical doctrines it teaches. Francis wants us to think the Reformation was little more than an attempt to reform abuses, as in the days of St. Francis of Assisi, and not a matter of heresy. Mr. Bergoglio even plans on going to Sweden to join in the "celebration" of this infamous quincentenary. Rather than review the 95 errors of Luther, let's look at the 96th error introduced by Vatican II--the Church is somehow "wounded" and "incomplete" because of "divisions in Christianity." As I've stated many times, Vatican II introduced the novel and heretical teaching that the "Church of Christ" is not the same as the traditional Roman Catholic Church. The new ecclesiology (i.e. the teaching on the nature of the Church) states that the Church of Christ "subsists" in its "fullness" in the Catholic Church because it has all of the "elements." Other sects are part of the Church of Christ according to how many elements they possess. To have all the elements is best, but to have just some is good and leads to salvation. Vatican II even states that Christ uses false sects as "a means of salvation." This destroys the dogma "Outside the Church there is no salvation" (Extra Ecclesiam Nulla Salus in Latin). The post-Vatican II "popes" (especially John Paul the Great Apostate and Ratzinger/Benedict) have advanced the idea that we need to "join all the elements together" in some loose fitting One World Sect where everything is permitted except the truth. If we don't, the Church is "wounded" and "incomplete." This is rank heresy of the worst kind. The unity of the One True Church of Christ is perfect and complete in and of Herself, and is completely unaffected by heretics, apostates, and schismatics who leave. According to theologian Scheeben, "Anything like a vague agglomeration of different bodies is absolutely excluded. 'There is one God and one Christ,' says St. Cyprian, 'and His Church is one, and the Faith is one, and one the people joined together in the solid unity of the body in the bond of concord. This unity cannot be broken, nor the one body divided by the separation of its constituent parts.'" (See A Manual of Catholic Theology 2:347; Emphasis mine). Pope Pius XI: "This being so, it is clear that the Apostolic See cannot on any terms take part in their [Protestant] assemblies, nor is it anyway lawful for Catholics either to support or to work for such enterprises; for if they do so they will be giving countenance to a false Christianity, quite alien to the one Church of Christ. Shall We suffer, what would indeed be iniquitous, the truth, and a truth divinely revealed, to be made a subject for compromise?" (See Mortalium Animos, # 8, 1928; Emphasis mine).
" So, Venerable Brethren, it is clear why this Apostolic See has never allowed its subjects to take part in the assemblies of non-Catholics: for the union of Christians can only be promoted by promoting the return to the one true Church of Christ of those who are separated from it, for in the past they have unhappily left it. "(Ibid, # 10, Emphasis mine). "They add that the Church in itself, or of its nature, is divided into sections; that is to say, that it is made up of several churches or distinct communities, which still remain separate, and although having certain articles of doctrine in common, nevertheless disagree concerning the remainder; that these all enjoy the same rights; and that the Church was one and unique from, at the most, the apostolic age until the first Ecumenical Councils. Controversies therefore, they say, and longstanding differences of opinion which keep asunder till the present day the members of the Christian family, must be entirely put aside, and from the remaining doctrines a common form of faith drawn up and proposed for belief, and in the profession of which all may not only know but feel that they are brothers." (Ibid # 7; Emphasis mine). Pope St. Pius X: "The Church alone is the depository of the truth." (Address on the Beatification of Joan of Arc, 1909). John Paul II: "Indeed, the elements of sanctification and truth present in the other Christian Communities, in a degree which varies from one to the other, constitute the objective basis of the communion, albeit imperfect, which exists between them and the Catholic Church. To the extent that these elements are found in other Christian Communities, the one Church of Christ is effectively present in them. For this reason the Second Vatican Council speaks of a certain, though imperfect communion. The Dogmatic Constitution Lumen Gentium stresses that the Catholic Church 'recognizes that in many ways she is linked' with these Communities by a true union in the Holy Spirit." (See Ut Unam Sint # 11, 1995; Emphasis mine). John Paul II: "Ecumenism is directed precisely to making the partial communion existing between Christians grow towards full communion in truth and charity." (Ibid, # 14; Emphasis mine). John Paul II: "The 'universal brotherhood' of Christians has become a firm ecumenical conviction. Consigning to oblivion the excommunications of the past, Communities which were once rivals are now in many cases helping one another: places of worship are sometimes lent out..."(Ibid # 42; Emphasis mine). Benedict XVI: "The Catholic Church has no right to absorb other Churches. A basic unity of Churches, yet remain Churches, yet become one Church--must replace the idea of conversion." (See Theological Highlights of Vatican II, Paulist Press: NY, 1966, pg. 61, 68--before "election" as "pope"; Emphasis mine). Let's remember that besides the glaring contradictions above, Luther was himself quite evil. His idea of "justification by Faith alone" (aka "sola fide") replaces the Catholic dogma of interior justification (sin is really wiped out) with exterior justification (people remain sinners, but God covers them with the grace of Christ when they believe like "snow on dung."). As a consequence he said some pretty bad things. With which quotes below would Francis be in agreement? Martin Luther: "Be a sinner, and let your sins be strong, but let your trust in Christ be stronger, and rejoice in Christ who is the victor over sin, death, and the world. We will commit sins while we are here, for this life is not a place where justice resides... No sin can separate us from Him, even if we were to kill or commit adultery thousands of times each day." (See Let Your Sins Be Strong, from 'The Wittenberg Project;' 'The Wartburg Segment', translated by Erika Flores, from Dr. Martin Luther's Saemmtliche Schriften, Letter No. 99, 1 Aug. 1521. - Cf. Also Denifle’s Luther et Lutheranisme, Etude Faite d’apres les sources. Translation by J. Paquier [Paris, A. Picard, 1912-13], VOl. II, pg. 404; Emphasis mine). 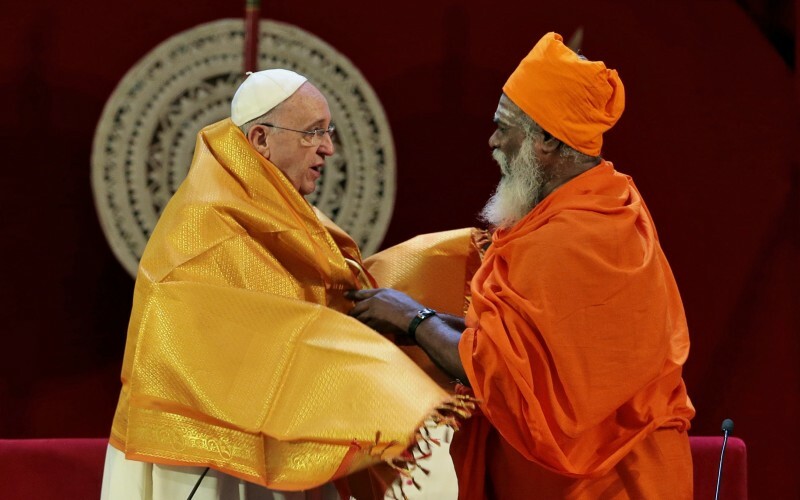 Bergoglio (aka "Pope" Francis) wants us to think the Church is "wounded" or "lacks full unity" and it can only be "healed" by a One World Sect because "proselytism is nonsense." The elements of sanctification and truth are present in these Protestant sects and will grow to full communion with Catholics in this new World-Wide Ecumenical Sect. Bergoglio will go and "celebrate" the corruption of faith and morals that began in Protestantism and evolved into Modernism. He will rejoice over a man who broke his priestly vows to marry an apostate nun while encouraging all manner of evil with his false teachings. Luther had a near pathological hatred of Jews. (Funny how the Modernists accuse Traditionalists of being anti-Semitic, while ignoring the real deal when it suits their purposes). We don't need to worry about a "wounded" Church that needs healing; only be concerned with falling for Bergoglio's poison ecumenism. It's celebrating a phony "reformation" which encourages an already sick world that needs the One True Church of Christ to "let your sins be strong." On September 16, 2016, Fr. Gabriel Amorth passed on at the age of 91. Fr. 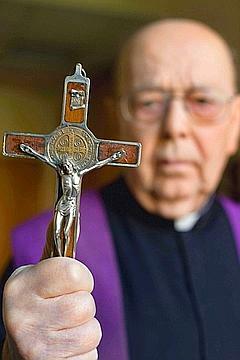 Amorth was the exorcist for Rome and wrote two books, An Exorcist Tells His Story and An Exorcist: More Stories. Fr. Amorth claimed there were "members of Satanic sects" in the Vatican including some "cardinals." Why a man who performed so many exorcisms (and ordained in the 1950s) didn't see the devil as the post-Vatican II "popes" baffles me. He was a very controversial figure, but one thing he said (and with which I completely agree), was his contention--supported in sound theology--that the new Rite of Exorcism imposed by John Paul the Great Apostate in 1999 was "useless" in battling demons. This post will demonstrate why this is so. In January of 1999, "Pope" John Paul II promulgated De Exorcismis et Supplicationibus Quibusdam, a new Rite of Exorcism, supplanting the venerable and traditional Rite of 1614 AD. The new Rite is based on the Vatican II Catechism of the Catholic (sic) Church of 1992, which defines exorcism as, "When the Church asks publicly and authoritatively in the name of Jesus Christ that a person or object be protected against the power of the Evil One and withdrawn from his dominion, it is called exorcism." (#1673; Emphasis mine). An exorcism is NOT a prayer asking God to release someone from the power of the devil. Exorcism is a command issued to Satan in the name of God. The very word exorcism tells you that – exorcizo, I adjure. The Traditional Rite states, "Exorcizo te, immundissime spiritus…in nomine Domini nostri Jesu Christi" – "I exorcize you, unclean spirit…in the name of our Lord Jesus Christ." It is a command issued to the demon in the name of Christ. The new Rite gives the Vatican II sect "priest" a choice of "deprecatory" and "imperative" exorcisms. The "deprecatory" is simply a prayer to God asking for His help. The "imperative" is commanding the demon in the name of Christ. According to the new Rite's rubrics, the deprecatory must always be used, and the imperative is an "option" rarely, if ever, to be used. 4. In order to better test these signs [of possession], the priest should question the demoniac after one or other exorcism as to what he feels in his mind or body, so that in this way he can also learn which words more greatly disturb the demons, so as then to bear down on them and repeat them all the more. 5. The priest should stay alert for tricks and deceptions that demons use to mislead the exorcist. For they will give false answers as much as possible, and show themselves only with difficulty, in order that the exorcist at length become worn out and give up the exorcism; or the ill person might appear not to be harassed by the devil. 6. Occasionally, after they appear, the demons hide and leave the body almost free of all disturbance, so that the ill person might think he is completely freed. But the exorcist should not stop until he sees the signs of liberation. 8. Some demons point out an act of witchcraft which has been done [to cause possession], by whom it was done, and the way to undo it; but the demoniac should be careful not to have recourse to sorcerers, fortune-tellers, or other such persons, on this account, but should go to the ministers of the Church rather than use any superstitious or otherwise illicit means. 9. Sometimes the devil grants the sick person relief and permits him to receive the Holy Eucharist so that he might seem to have departed. In short, there are countless devices and tricks of the devil to deceive man, which the exorcist should beware, lest he be deceived. 13. …Also relics of Saints, where available, safely and properly fastened and covered, may be reverently applied to the chest or head of the possessed. Care must be taken that the sacred objects are not improperly handled or harmed in any way by the demon. Because of danger of irreverence, the Holy Eucharist should not be placed upon the head of the possessed person or elsewhere on his body. 14. The exorcist should not engage in a great deal of talking or ask unnecessary or curious questions, especially concerning future or secret matters not pertaining to his task. But he should command the unclean spirit to be silent, except to answer his questions. Nor should he believe the demon if he pretends to be the soul of some Saint or deceased person or a good Angel. 15. However, there are necessary questions, for example, concerning the number and names of the possessing spirits, the time and reason they entered, and other things of this sort. The exorcist should restrain or spurn the rest of the devil’s nonsense, laughter and foolishness, and advise those present, who should be few, that they must not pay attention to these things nor question the possessed person, but rather humbly and earnestly pray to God for him. 16. The exorcist should read and carry out the exorcism with strength, authority, great faith, humility and fervor, and when he sees that the spirit is especially tormented, then he should persist and bear down all the more. And whenever he sees that the possessed person is being disturbed in some part of his body, or stung, or that a swelling appears somewhere, he should make the sign of the cross on that area and sprinkle it with holy water which should be on hand. 17. He is also to observe at which words the demons tremble more, and then he should repeat these words more often. When he reaches the threatening words, he should say them repeatedly, always increasing the punishment. If he sees that he is making progress, he should continue for two, three, or four hours, or even longer if he can, until he obtains the victory. 19. If he is exorcising a woman, he should always have persons of integrity with him to hold the possessed person while she is agitated by the demon. These people should be close relatives of the suffering woman if possible. Mindful of decency, the exorcist should be careful not to say or do anything which could be an occasion of an evil thought to himself or the others. 20. While he is exorcising, he should use the words of Sacred Scripture rather than his own or someone else’s. He should command the demon to tell him if he is held in that body because of some magic, or sorcerer’s signs or devices. If the possessed person has consumed things of this sort orally, he should vomit them up. If they are elsewhere outside his body, he should reveal where they are, and once found, they are to be burned. The possessed person should also be advised to make known all his temptations to the exorcist. The Traditional Rite of Exorcism had a three-fold sequence of exorcisms, which is now a single "prayer for relief." As you can see, the New Rite of Exorcism is really no exorcism at all. Just as the sacrament of Extreme Unction has become a "spiritual get-well-soon card" in the Vatican II sect's "Anointing of the Sick," exorcism is little more than asking for God's help while downplaying all the sacred signs of our Faith. Even when a validly ordained priest uses it, like the late Fr. Amorth, it proves useless. Not satisfied with the elimination of the priesthood, Wotyla had to destroy the Rite of Exorcism itself. After all, why would the Modernist Vatican want to keep those traditional prayers asking their new and infernal master to leave them? With the "canonization" of Mother Teresa, false "Pope" Francis has given the world yet another example of ecumenical adoration. Mother Teresa performed many and wonderful acts of mercy. However, she exalted the Corporal Works of Mercy over the Spiritual Works of Mercy. Her ecumenism was all pervasive. 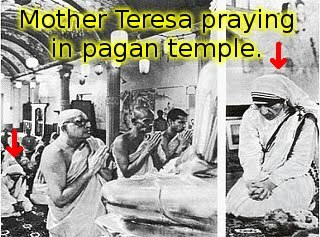 She is quoted as having said, "I’ve always said we should help a Hindu become a better Hindu, a Muslim become a better Muslim, a Catholic become a better Catholic." She also participated in Buddhist worship. These horrific examples of her apostasy could be multiplied, but I have no need to belabor the point. No Traditionalist is in position to say if she (or anyone else except Judas) is in Hell or not, as she may have repented in the last moments of her life and achieved Heaven. "But before all things have a constant mutual charity among yourselves: for charity covereth a multitude of sins." (1 Peter 4:8). However, canonization is not merely a declaration that someone "made it to Heaven," but that they are worthy of emulation by the Faithful. As she denied the One True Church and its absolute necessity for salvation, she is not so worthy. This latest act of ecumenical insanity does provide me an opportunity to show (a) what the Church taught about false religions and praying with false sects prior to Vatican II, (b) that Catholic dogma cannot change, (c) that the Vatican II sect promotes the very things the Church always condemned, (d) that it is the teaching of the Church that the pope can lose his office by Divine Law should he become a manifest heretic as a private theologian (and further, that the Divine Law prohibits heretics, schismatics, and apostates from obtaining the papal office). Ergo, it is morally certain that there has been no pope since at least November 21, 1964 when Paul VI signed Lumen Gentium of Vatican II. Canon 1258 sec. 1: "It is unlawful for Catholics to assist actively in any way at, or take part in, the religious services of non-Catholics. sec. 2: A passive or merely material presence may be tolerated, for reasons of civil duty or honor, at funerals, weddings, and similar celebrations, provided no danger of perversion or scandal arises from this assistance. In doubtful cases the reason for assisting must be grave, and recognized as such by the bishop." (See The Sacred Canons, B.Herder Book Co. , pg. 512; Emphasis mine) Note: That which is of natural law and Divine positive Law may never change and admits of no exceptions. In 1729, the Holy Office stated that participation in heretic and schismatic worship is "universally prohibited by natural and Divine Law" and that "no one has the power to dispense" and "nothing excuses." "They should totally shun their religious celebrations, their buildings, and their chairs of pestilence which they have with impunity established to transmit the sacred teachings...They should avoid them as strangers and thieves who come only to steal, slay, and destroy. For the Church's children should consider the proper action to preserve the most precious treasure of faith, without which it is impossible to please God, as well as action calculated to achieve the goal of faith, that is the salvation of their souls, by following the straight road of justice." (See Graves ac Diuturnae, #4, 1875; Emphasis mine). 58. Truth is no more immutable than man himself, since it evolved with him, in him, and through him. 59. Christ did not teach a determined body of doctrine applicable to all times and all men, but rather inaugurated a religious movement adapted or to be adapted to different times and places. 62. The chief articles of the Apostles' Creed did not have the same sense for the Christians of the first ages as they have for the Christians of our time. 64. Scientific progress demands that the concepts of Christian doctrine concerning God, creation, revelation, the Person of the Incarnate Word, and Redemption be re-adjusted. 8. 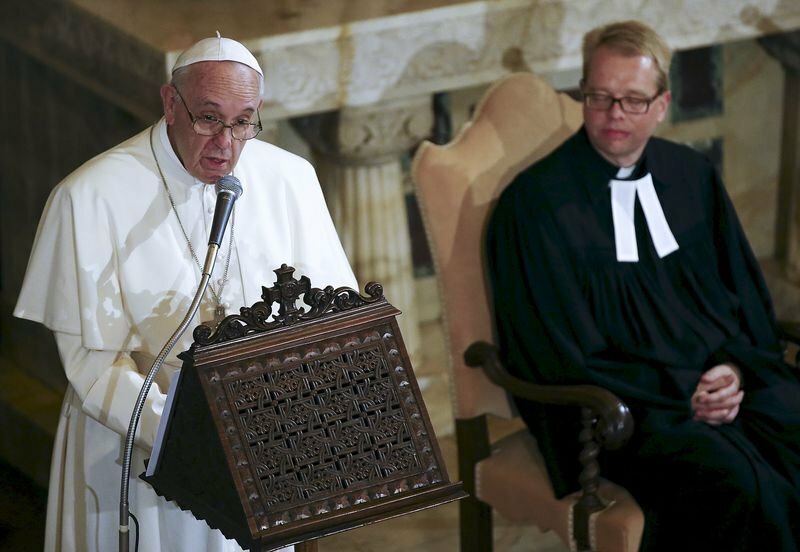 "This change of heart and holiness of life, along with public and private prayer for the unity of Christians, should be regarded as the soul of the whole ecumenical movement, and merits the name, 'spiritual ecumenism.'" 108. Where appropriate, Catholics should be encouraged, in accordance with the Church's norms, to join in prayer with Christians of other Churches and ecclesial Communities. Such prayers in common are certainly a very effective means of petitioning for the grace of unity, and they are a genuine expression of the ties which still bind Catholics to these other Christians. Shared prayer is in itself a way to spiritual reconciliation. 111. Representatives of the Churches, ecclesial Communities or other groups concerned should cooperate and prepare together such prayer. They should decide among themselves the way in which each is to take part, choose the themes and select the Scripture readings, hymns and prayers. 118. In liturgical celebrations taking place in other Churches and ecclesial Communities, Catholics are encouraged to take part in the psalms, responses, hymns and common actions of the Church in which they are guests. If invited by their hosts, they may read a lesson or preach. 137. Catholic churches are consecrated or blessed buildings which have an important theological and liturgical significance for the Catholic community. They are therefore generally reserved for Catholic worship. However, if priests, ministers or communities not in full communion with the Catholic Church do not have a place or the liturgical objects necessary for celebrating worthily their religious ceremonies, the diocesan Bishop may allow them the use of a church or a Catholic building and also lend them what may be necessary for their services. Under similar circumstances, permission may be given to them for interment or for the celebration of services at Catholic cemeteries. (Rather than list the long citations from myriad canonists and theologians about this topic, (all teaching that heresy deprives a pope of his office by Divine Law), I will cite from the discussion on the topic at the First Vatican Council--definitive proof that a heretic can't be pope). This teaching at the Council was confirmed by theologian Iragui: "In the First Vatican Council, the following question was proposed: Whether or not the Roman Pontiff as a private person could fall into manifest heresy? ...theologians commonly concede that the Roman Pontiff, if he should fall into manifest heresy, would no longer be a member of the Church, and therefore could neither be called its visible head." (See Manuale Theologiae Dogmaticae, Madrid: Ediciones Studium , 371). According to canonists Wernz and Vidal, "Through notorious and openly revealed heresy, the Roman Pontiff, should he fall into heresy, by that very fact is deemed to be deprived of the power of jurisdiction even before any declaratory judgment of the Church..." (See Ius Canonicum, Rome: Gregorian  2: 453). (i) the promotion or elevation, even if it shall have been uncontested and by the unanimous assent of all the Cardinals, shall be null, void and worthless;"
Held the Assisi abominations where all the false sects were invited to pray for peace to their false gods (1986 and 2002) --this included Hindus, Buddhists, and Voodoo practitioners along with every heretic and schismatic to boot! In remembering with renewed gratitude our meeting on 17th January, when I was cordially welcomed by you and by the Jewish Community of the city in the Great Synagogue, I wish to express my most heartfelt wishes for the feast of Passover. It points out that the Almighty has released his beloved people from slavery and brought them to the Promised Land . May God also accompany you today with the abundance of his Blessings, protect your community and, in His mercy, bestow peace upon everyone. I ask you to pray for me, as I assure you of my prayers for you: may the Almighty allow us to be able to grow more and more in friendship. "Canonizes" Mother Teresa September 4, 2016. She participated in Buddhist worship and declared "I love all religions." Members of the One True church are barred by natural and Divine Positive Law from active participation in non-Catholic worship. Catholic dogma cannot change into something other than what it was always understood to mean. To say otherwise is the heresy of Modernism. The Church has always taught that praying with non-Catholics at their services constitutes heresy. Divine Law teaches that heretics cannot become or remain pope. John Paul II, Benedict XVI and Francis have all participated actively in non-Catholic worship. The Vatican II sect teaches the opposite of what the Church always taught about active participation in non-Catholic worship. Can the Vatican II sect be the Roman Catholic Church of all time? Can the post-Vatican II leaders be truly "popes"? The facts speak for themselves. 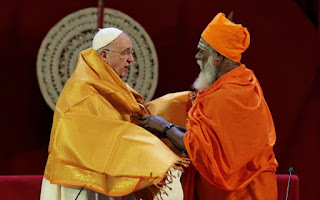 Mr. Bergoglio, the phony pope, makes two phony saints (John Paul II and Mother Teresa) to promote the heretical Vatican II ecumenism as an ideal for all to follow. Christ wants us all to be one in the Truth which leads to eternal life. Frankie wants everybody to join his One World Ecumenical Sect that makes all one in falsehood; lies that can only lead to eternal damnation. St. Paul tells us in Hebrews 9:27, "And as it is appointed unto men once to die, and after this the judgment:"
Since the advent of the Vatican II sect, the world is becoming increasingly pagan. I can't even count the number of times I've heard people who profess to be "Catholic" say "It's karma" when someone who had done evil, gets what he deserves (or someone does something good and a good action comes their way). I wince, and interject, "No, it's Divine Providence. Karma is a pagan Hindu concept." Also, I will frequently hear, "Maybe I'll be a (such and such) in my next life." This is a clear reference to the pagan doctrine of reincarnation, whereby people's souls go through cycles of birth, death, and re-birth until they achieve Nirvana (which means to be "blown out" like a candle) so as to escape the cycle and achieve "oneness" with the universe (a type of pantheism). Reincarnation is in vogue like never before. The list of people who believe in reincarnation is getting longer and gaining more prominent names. In the past, General George S. Patton, Mark Twain, Ralph Waldo Emerson, Walt Whitman, Henry Ford, and Albert Schweitzer all believed in a cycle of rebirth. More recently, the late Robin Williams was a believer in reincarnation as well (See my post of 8/17/14 for more on that topic). "Conservative" Vatican II sect member and actor Martin Sheen believes in past lives and has stated, "Our children come to us to make up for indiscretions in past lives. They are hold-overs from lifetimes we have not solved." Other contemporary "reincarnationists" include Steven Seagal, Sylvester Stallone, Jerry Springer, and Phil Collins, to name only a few. 1. "Many Catholics think that a single life of anywhere from a few seconds' duration to 110 years is not enough time to determine the destiny of a soul for all eternity. They feel that God would be unloving if He (excuse the conventional pronoun) were to condemn a sinner to hell, but irrational if He rewarded a baby born dead with heaven. Some of these Catholics see the wheel of rebirth as a more plausible form of purgatory. " 2. "The other main reason that Catholics -- and other Americans -- adopt a reincarnational worldview turns on evidence. Much, perhaps most, of what passes as evidence comes from the popular media. Stories about people who have seeming memories of a previous life or mysterious phobias or obsessions or talents that cannot be explained by events in this life abound, and they often set people to wondering. The History channel serves up occasional stories of apparent rebirth, and these are based on research by paranormal investigators. With solid theological formation destroyed in the Vatican II sect, it's no wonder people will get taken in by these reasons. This post will give a brief explanation of reincarnation and show why these reasons don't support belief in past lives. 1. A goal of ultimate perfection for humanity. 2. An evolution towards perfection that is achieved through reincarnation. 3. Your karma will affect the type of reincarnation you have; a bad karma will mean a rebirth in a worse or lower state, while a good karma will mean rebirth to a better or higher state. 4. Your self survives death in successive afterlives. 5. You get multiple chances to make amends for the wrongs you've committed. 6. You will always be reincarnated in a body susceptible to die until you reach Nirvana. 7. There are multiple planets, universes, and dimensions upon which you can be reincarnated; it is not limited to Earth. It's obvious that reincarnation is incompatible with Church teaching. However, I wish to respond to the reasons most commonly given above for belief in this false doctrine. It is based on feelings and sensation more than anything else, which is why an appeal to the teaching of the Church or quoting the Bible will usually hold no sway over such believers. Deja vu (from the French for "already seen") is the sensation that something you are experiencing (usually for the first time) has been experienced by you in the past. This is then attributed to having done the particular experience "in a past life." There are sound arguments to reject the reincarnationists' reasons in addition to Church teaching; these I offer below. 1. One lifetime is enough to decide your eternal fate. What difference does it make if a person lives 7,000 years in various incarnations or 70 years in one lifetime when compared to eternity? Are not both infinitesimal when compared to eternity? Everyone is given ample opportunity to get to Heaven, and no one goes there unless they choose it! Not all experiences admit of second chances. Reincarnationists are fond of comparing life to a test that a kind teacher lets you retake if you fail. I could just as easily analogize to someone committing suicide by shooting himself in the head. There is no "do over," and the result is permanent. Provided that the person was of sound mind, the choice was freely made. Purgatory is for getting rid of imperfections; the person has already decided to choose God within their lifetime, so reincarnation is nothing like the dogma of Purgatory. 2. Reincarnation does nothing to explain evil and is unjust unlike Hell. Children can be baptized because they did nothing wrong in contracting Original Sin. It is simply the deprivation of sanctifying grace caused by the Fall of the first man. In a similar way, if a wealthy couple squanders millions of dollars, their children will be born into a poor state through no fault of their own but those children can work their way to wealth. Children who die without baptism are generally thought to enjoy some natural happiness (Limbo) because of no personal fault. Contrast this with reincarnation. In what sense does your self continue? If you have no memory of what you did in a past life (and you may not even exist as the same gender or on the same planet/dimension), in what sense do you survive death? If there is no bodily continuity, memory, or intellectual awareness, it seems like you're suffering for what someone else did, which is unjust. Reincarnation also offers no solution to the problem of evil. For example, if someone is born with no arms because they assaulted people in a prior life, and they assaulted people in a prior life because before that life they couldn't control their temper, whence did evil originate? It's an infinite regress of past lives with no explanation. How did suffering begin in the first place if each life of suffering was caused by past bad karma? Moreover, there would be no free will in the view of reincarnation. Eventually, everyone will come to some "Nirvana." So it doesn't matter if you're Hitler or St. Francis of Assisi, you both get to the same place regardless of what you do. On the other hand, Heaven and Hell are freely chosen with the wicked punished and the good rewarded. 3. Deja vu, hypnotic recall of past lives, and "spontaneous recall" are easily explained without reincarnation. According to a 2012 study in the peer reviewed journal Consciousness and Cognition 21 (2) 969-975, it was suggested recognition based on familiarity can cause a sensation of deja vu. Using virtual reality technology, it was found that similarity between a scene's spacial layout and the layout of a scene previously experienced (but not recalled) can lead to a subjective feeling of "having been there before despite knowing otherwise." This is also known as "cryptoamnesia." In simple terms it means that the subconscious relates a present event with a previous one that the conscious mind does not remember. One event is similar to another and the mind fuses them together, giving the sensation that this "happened before." So-called "past lives" brought out under hypnosis are fraught with difficulties. According to hypnosis expert James E. Parejko in an article published in the Journal of the American Institute of Hypnosis (Jan. 1975), he listed four factors of subconscious intervention during hypnosis: (a) Expectations of the hypnotist, (b) diminished critical thoughts in the mind that accompany deep trance states, (c) a triggering idea by the hypnotist, and (d) the ability of the mind to hallucinate. A case in point of inherent unreliability was that of Bridey Murphy. Through hypnosis, a woman allegedly regressed to 18th century Ireland. She suddenly spoke Gaelic, described the coastline where she lived, discussed the customs and spoke like a life-long Irish native. Upon further investigation, "Bridey Murphy" (the name of the person she allegedly was in this "past life") never existed but was a figment of the woman's imagination. She was raised by her grandmother who spoke Gaelic and kept history books on Ireland which she related to her granddaughter. The hypnotic subject had forgotten the language and history as she got older, but it was brought back under hypnosis with the mind giving life to the memories by manufacturing a name. (Let's not forget that some of these subjects, who dabble in the occult, could be under demonic control). In the famous cases of Dr. Ian Stevenson, who investigated children claiming to have "spontaneously recalled" a past life, the doctor himself admits of bias in his study due to cultural conditioning. He wrote, "...the principal sites of abundant reported cases are: northern India; Sri Lanka; Burma; Thailand; Vietnam; western Asia, especially south central Turkey, Lebanon, and Syria; and northwest North America, among the natives of that region. The peoples of these areas (of the groups among whom the cases occur) believe in reincarnation." (See Stevenson, Ian, "The Explanatory Value of the Idea of Reincarnation," Journal of Nervous and Mental Disease Sept. 1977, 308). He further admits, "Neither any single case nor all the investigated cases together offer anything like a proof of reincarnation." (Ibid, 325). So much for the most reputable research they have to date. Reincarnation is dangerous on many levels. It makes people complacent that they can do wrong and get "multiple chances" to do it over until they get things right. People "deserve" their fate from a previous life, so why go out of your way to help? The Church makes clear that this life is the only one we will ever have, so get things right the first and only time you're here. Don't talk about "karma" and "your next life," as these are false, pagan ideas. As G.K. Chesterton wrote, "Hell is God's great compliment to the reality of human freedom and the dignity of human choice."